You are currently browsing the category archive for the ‘Shaykh Muhammad al-Yaqoubi’ category. Say La hawla wa la quwata illa billah’, there is no power, there is no capacity but by Allah. 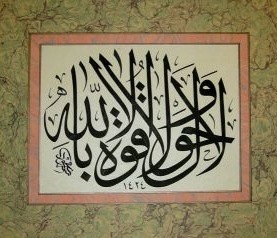 ‘Hawl means ‘capacity’, and ‘quwa’ means ‘power’- there is no capacity nor any power but from Allah and by Allah. So if you do dhikr ‘La hawla wa la quwata illa billah’, it is a form of dhikr, and it is repeated for those people who can’t handle their affairs. If you have done all your best and you can’t get out of the problem then say ‘La hawla wa la quwata illah billah’ because you’re doing it by your own means, you have to refer to the means of Allah subhanahu wa ta’ala. You think you can solve your problems? This is why your problems are not solved, leave them to Allah, Allah will solve them for you, provided you do what He commanded you to do –with the ibaadat together. La hawla wa la quwata Illa billah – this sentence is a treasure ‘kanz’, was revealed to Rasulullah ṣallallahu ‘alaihi wa alihi wa ṣalam from Al Jannah. Everything that hurts a believer is a calamity. Tests are like gold. You test gold in fire to test if its real, test its substance. That is the true nature of calamities- to test you. Allah knows your state before and after the test. Your test is for you to learn and others around you. Most of our actions are reactions- control your reactions! Shaykh Muhammad al-Yaqoubi during the “Revelation of the Unseen” by Shaykh Abdal Qadir al-Jilani course in Sheffield, 2009.